LONDON, England (CNN) -- The person who leaked British lawmakers' controversial expense claims earlier this year, triggering a national scandal, was motivated by outrage at apparent equipment shortages for British troops, a newspaper said Friday. The mole was angry at apparent equipment shortages for British troops deployed around the world. The mole was one of 20 people employed to process and censor the expenses claims before their scheduled official release in July, according to The Daily Telegraph. The man leaked the claims to the Telegraph, which printed them in a series of front-page articles in May. The articles brought public embarrassment to Parliament and even forced some lawmakers to resign. The 20 employees going through the claims were guarded by British soldiers to ensure nothing was leaked. The soldiers were working there in between tours of duty in order to earn extra money to pay for badly needed military equipment, the Telegraph said. One of the soldiers had taken on the temporary work to earn enough money to buy a lightweight Kevlar protective vest similar to the ones used by U.S. troops, while another soldier was trying to earn money for desert boots, gloves, and sunglasses, the Telegraph said. Hearing the soldiers' stories while at the same time looking through what were revealed as excessive claims made by lawmakers, prompted the mole to take action, the newspaper said. "It's not easy to watch footage on the television news of a coffin draped in a Union Jack and then come in to work the next day and see on your computer screen what (members of Parliament) are taking for themselves," the mole told the Telegraph. The Telegraph does not name the man who leaked the claims. He tells his story in a book, "No Expenses Spared," released Friday about the scandal written by two Telegraph reporters. Speaking in the book, the mole says he is "bloody glad" he released the information, but is disappointed in the reaction from lawmakers so far. Controversial claims detailed by the newspaper included thousands of dollars' worth of interest on a mortgage that had already been paid, money spent to clean a moat on a country estate, and more than $1,000 spent on a small house on a pond for ducks. More than a dozen members of Parliament caught up in the scandal promised to step down in the next election. It led Prime Minister Gordon Brown to reshuffle his Cabinet and forced the speaker of the House of Commons to resign, the first time that had happened since 1695. Claims for allowances for second homes -- which most lawmakers have because they need to be in London for parliamentary business -- were a big point of controversy. The Telegraph exposed how some lawmakers "flipped" the designation of their main and second homes to avoid taxes or make big allowance claims. Many lawmakers defended their claims as being within the rules. But even where that was the case, the public criticized lawmakers for greed and for taking advantage. The reports forced the government to release the claims in June, a month earlier than planned. But unlike the information revealed by the Telegraph, the officially released documents were redacted, with key details blocked from view. Parliament said the edits were made to protect the security and privacy of lawmakers, their staffs and third parties. 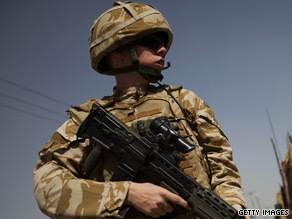 The issue of equipment shortages for British troops has been simmering for years. Some relatives of fallen soldiers have blamed their loved ones' deaths on a lack of proper gear in the battlefield. This month, the widow and father-in-law of Sjt. Paul McAleese, killed by a bomb in Afghanistan, said the soldier had voiced concerns about safety conditions at his base in Wishtan. The father-in-law, Stephen Minter, wrote a letter to Brown detailing what he believed to be a lack of equipment for British troops. In July, Sasha Buckley, the childhood sweetheart of Rifleman Daniel Hume, who was killed in Afghanistan, voiced the same concerns to the Daily Mail newspaper. "The real tragedy is that he won't be the last soldier killed out there," she told the paper. "There will be many more coming home unless the government give them the support they need. That means more equipment now -- soldiers like Dan deserve better." The Ministry of Defence has maintained that soldiers are properly equipped. In a statement Friday, a ministry spokesman said providing the best equipment for British troops is the top priority. "Every soldier who deploys to Afghanistan receives Osprey body armor and a Mark 6a helmet," the spokesman said in a statement. "They also receive a black bag containing all their operational requirements. Valued at £3,500 ($5,600), it contains everything a soldier will need from boots and socks to camel backs (strap-on water bottles). Commanders now have a variety of helicopters, protected patrol vehicles, unmanned aerial vehicles and other key equipments at their disposal, and we are committed to ensuring that their needs are met, both in the short and long term. Since 2006, we have delivered equipment valued at more than 10 billion pounds ($16 billion) to the armed forces."